Secular Pro-Life Perspectives: Encouraging secular participation. The weekend before last I had a wonderful time meeting up with other SPL members and representing Secular Pro-Life at San Francisco’s various pro-life events. On Saturday afternoon, SPL spoke at the Walk for Life West Coast rally, then gathered together and held our banner high for the entire Walk. On Sunday, pro-life atheist Ellen and I tabled at the first ever west coast Students for Life of America training conference, which lasted all day. Throughout all of these events, I was inspired by the number of religious pro-lifers who so warmly welcomed us. They said our speech was refreshing and our attendance encouraged them. They thanked us for our participation. Some people seemed downright relieved to have us there. It was a lovely response that recurred all weekend; it’s clear to me that most religious pro-lifers happily accept our presence. I think most religious pro-lifers actually want us to be more involved and visible in the pro-life movement. But many other things happened last weekend that make me think, yes, people of faith want us involved, but they haven’t the slightest idea how to encourage our participation. For example, I do not feel encouraged when I'm trying to speak about religious diversity and you're actually blocking my face with a crucifix. Seriously? Time and again it was clear that the events were designed for Christian participation. 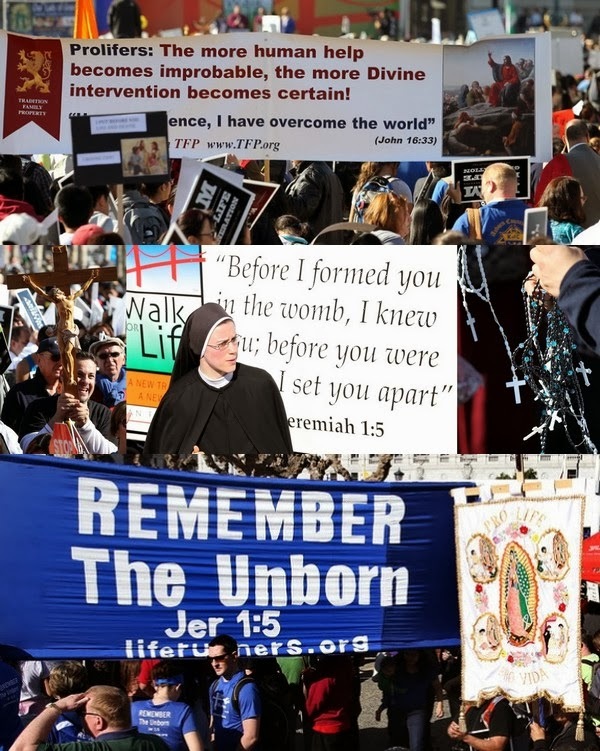 And I don’t feel that way simply because there were (as there always are) so many religious signs at the Walk, “Soul at conception,” “Such-and-such Parish for Life,” prayers over bullhorns, groups singing hymns, etc. That’s just how people participating in the Walk chose to express their beliefs, which is their right. But beyond the average participant, the way the Walk itself was organized seemed to endorse a specifically Christian discussion. The rally opened with a somewhat lengthy prayer from an Anglican bishop, continued with a brief speech from a Catholic chaplain discussing the “spiritual desert our country has become,” followed by the Archbishop of San Francisco* reading a letter from another Archbishop sending greetings and gratitude from the Pope, and every speaker except for me focused very much on God’s plan and purpose as reasons for our pro-life activism. In fact, I think I may have been literally the only person on stage who did not refer to God and faith in my discussion of pro-life activism. Ellen took this picture. She thought it was funny that I didn't really know what to do with myself during the Anglican bishop's prayer. The following day, the SFLA conference wasn’t as overt. There were many speakers whose messages applied independent of religious belief. (And, by the way, if you can go to an SFLA training conference sometime, I recommend it. It was very well put together, with a lot of ideas I hadn’t considered. Very interesting.) However, there were also many speakers who referenced or relied heavily on their Christian faith in their messages, there was a group-lead prayer, a sermon from Pastor Walter Hoye, and at least two occasions where speakers made a point of mentioning they think atheists really struggle to defend their worldview. That last part really did me in. Abortion isn’t the only topic I’m passionate about. I have very strong opinions on a lot of topics, including religion and God specifically, and including topics indirectly related to religion, like homosexuality, like certain gender issues, and so on. I spent the entire weekend saying not one word about my passionate feelings on many other issues, despite being saturated by people expressing views I don’t hold, because I wasn’t there to push those views on people: I was there to work together to fight abortion. And here we are—Ellen and me—sitting at a table labeled “Secular Pro-Life,” having talked to people all day about the secular position and the fact that yes, we are both actually secular, and we get to sit silently by while people give us furtive glances and speakers talk about how our beliefs are indefensible? And Christians ask me why they don’t see more involvement from secular pro-lifers. Now, hear me out, because I’m a little bit conflicted about this. I have secularist friends who believe the pro-life movement would grow a great deal more if pro-lifers would remove religion from their pro-life advocacy. Nonreligious folk (including both people who don’t believe and people who believe but don’t really care) would take a greater interest if they realized there was something in this debate beyond faith. I think that's true. But, on the other hand, how many deeply religious people would take less of an interest? During the SFLA conference, one of the speakers whose message relied heavily on the Christian faith was David Bereit of 40 Days for Life. And, frankly, his talk was fantastic. While David and I don’t share the same faith, it was clear to me that the conference attendees were moved and inspired by his talk (“talk” doesn’t really do it justice though—it was more like very compelling story telling). And David wasn’t the only example—there were many speakers who spoke overtly about God and the role of Christians, and I think the overall effect of the day was that hundreds of pro-life high school and college students felt called to action, and excited to fulfill their roles in the pro-life movement. That’s a great effect to have on people. Faith gives many people hope and courage and joy, and that moves them to do good things. Obviously I don’t believe you must have faith to feel hope, courage, or joy. I don’t believe you must have faith to feel inspired to action. I don’t have faith, yet still feel all of those things, and I know many secularists who are the same way. Still, I recognize that, for many people, their faith is their main source of inspiration. So I'm not actually sure what overall effect we'd have if we removed religion entirely from the pro-life movement. I think it would encourage some people to participate, but it would leave others less inspired to help. And that’s one reason I don’t advocate removing religion entirely. I think there’s a time and place for religion in the movement. I just don’t think that time and place is constantly and everywhere. Later during the SFLA conference, a speaker mentioned that “this is not just a Christian event.” I don’t know if this particular speaker was suggesting SFLA ought to make it less Christian, or if he sincerely believed it had already been an experience people of many faiths or no faith could equally engage in. I suspect the latter. So again, I think many religious pro-lifers want secular pro-lifers to be more involved and more visible, but just aren’t sure how to make that happen. I have some ideas on that front, but before I put together a blog post of suggestions, I put the question to you guys, our SPL supporters. I don’t care if you personally are religious or secular or what—I’m interested in your ideas. 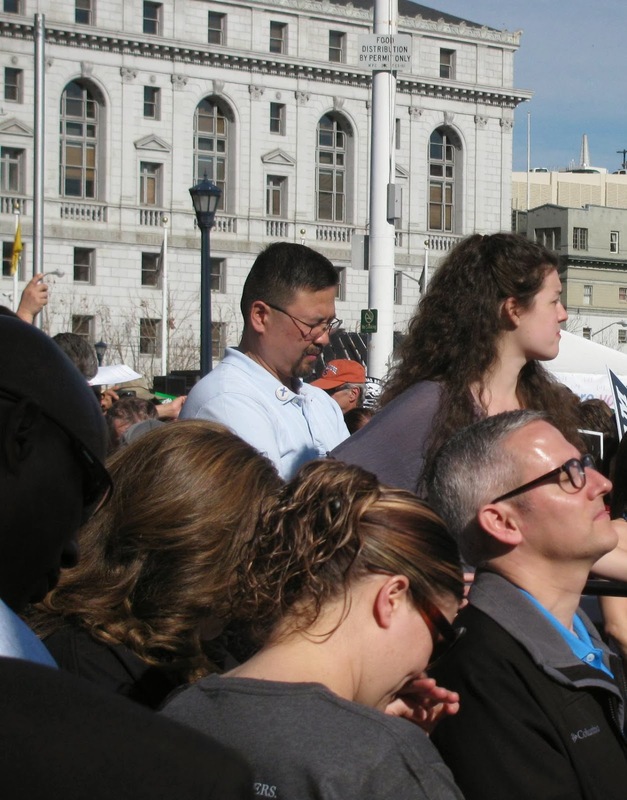 What are the best ways the pro-life movement can encourage secular participation? *Archbishop Cordileone said at the outset, in his greetings, that “we include everyone, of faith and no faith, of all ages, men and women.” Even just a small sentence like that makes a big difference in promoting inclusiveness, so thank you, Archbishop! Honestly, if people with very divergent views can't work together on areas of common cause, we're screwed. Not just with prolife, but everything. Sounds like you guys are making a noble effort. I don't think there's much of a question about "is religion good or bad for the prolife movement"? Without Christianity, there would be no American prolife movement. But it (quite obviously) has limitations for a movement that must succeed in a pluralistic context. I can't blame them for being explicitly Christian -- honestly it's good on their Christianity that they're on the right side of history on this issue. I can't find a way to justify expecting them to downplay who they are and what they're about and why. They care about human rights because of their Christianity; their Christian worldview provides their ontological foundation for morality (and as you no doubt are aware, it's hard for many Christians to accept atheistic moral claims that seem to lack ontological grounding). But there's a time and a place for things. They can do better, but they won't even know they need to without constructive feedback from you guys. Maybe one of the biggest contributions you can make in those conferences is opening their understanding of prolife from a secular perspective. If their goal is to influence the mainstream culture for prolife, then obviously they have a communication problem. The more you're seen and heard (constructively, of course), and the more your presence is felt, and if your engagement with them can diffuse rather than ignite friction points (aside from constructive friction), I think most of them will know how to accommodate. They're used to their ways because they've been carrying the prolife torch since forever, and you're the newcomers, so fairly or not it's on you to be as gracious and patient as constructivity demands until they catch on. And it sounds like you're doing great so far. I know you know all this; not trying to tell you what to do. just want to be encouraging. That is encouraging, thanks. I have the same hopes. I don't think it's necessary or desirable to remove religion from the movement. But it's both necessary and desirable to erase the idea that "pro-life" and "Christian" are synonymous. I get that for many people, they are inspired to be pro-life by their religious convictions, but that doesn't mean that pro-life is the same thing as Christianity, or vice versa. Right now, most groups and events say they welcome non-Christians, and I think they basically mean it, but I also think a lot of people view it as "you're welcome in our house" and not "this is everyone's house." I don't think the people holding those giant crucifixes in the first photo think of the Walk for Life as "everyone's house." And even if they do, that's really, really not coming across. "I also think a lot of people view it as "you're welcome in our house" and not "this is everyone's house."" What a succinct way to put it. This exactly. It's sad that some pro life Christians seem to think they "own" the pro life movement. If I could give a suggestion to secular pro lifers, it would be to step right up and "take" or "claim" your place in the pro life movement, and to actively solicit and welcome news coverage of your events and activities. Put your "face" on pro life America, don't just stand aside and let others put their face on it. Don't wait, in other words, for "religious" pro lifers to ":give" you a place. I am an active Mormon, and my religious beliefs do have something to do with my being pro life. I have experienced some of the hostility, especially from right wing Protestants, at pro life rallies. Religion or no religion, however, I would still be actively pro life. I am willing to stand with whoever is standing and (if prayers are being offered), I will pray with whoever is praying. I think anyone who wants to keep women safe and give them accurate information regarding abortion (not safe, health concerns, emotional concerns, pressure to abort, taking the life of a new person...), should be involved. Working at a pregnancy center there are many women who are nonreligious and need to understand science proves an embryo/fetus/unborn child is a real person. Unfortunately, I have to create my own handouts that would appeal to the non religious person. I have not seen secular pro life participation at the clinics, offering women alternatives or helping women who decided not to abort. All the groups and organizations that I know of who reach out to women in need are run and supported by Christian groups. Just so you know, I am a Christian who sees how religion has helped women change their minds and helped them heal after aborting. As different Christian denominations come together on this issue, we have to put aside some of our theological differences to work together. When attending Christian run events, I do expect there will be many people referring to their religious beliefs. 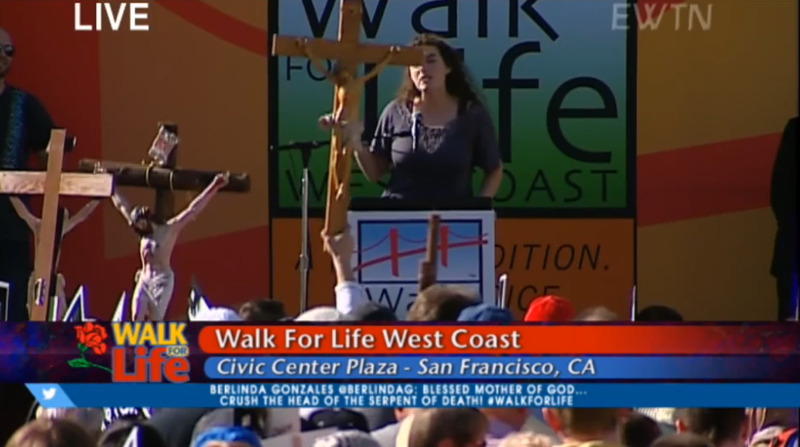 So a secular pro lifer should expect praying during events like a 40 Days for Life rally. I would go to a secular pro life event, but I have not been aware of one locally. I think secular pro lifers need to think about how they can get involved at clinics and promote events on a local level to get the message out that abortion is not the answer. I think there's room for that. Personally I hope to find time for more research on the different physical and emotional effects abortion can have on women. I am suspicious of the claims by both sides trying to stick to certain narratives so I would like to see for myself. Have you looked into that much yourself? "But it's both necessary and desirable to erase the idea that "pro-life" and "Christian" are synonymous." Partially agree with this, here is the part I agree with: being pro-life does not mean you must be a Christian. Everyone should be welcomed into this movement. However for those who are Christian it is not possible to be Christian and not support life. That being said the most unifying arguments for life are scientific. Because of this scientific arguments should be used because they apply to both religious and secular individuals. Dear Secular Pro Life: The first thing I have to do is recognize your courage in not just realizing that abortion is simply not justified by any circumstances, but actually acting on that very fundamental idea about life. The next thing is to assure you that if there are religiously-inspired pro lifers who are, shall we say, less than inviting, any pro lifer with common sense, with any capacity for love, definitely want you to participate. Please do find what you need to adapt to our approach to the pro life movement, because I cannot imagine religious pro lifers overlooking their Inspiration in organizing and making speeches. I pray that you are able to do that, because we need all of the help we can get. Thank you for the recognition. And I agree that pro-lifers of faith have born the brunt of the pro-life work for decades. No denying that, and it means a lot. However I feel this is a catch-22. You are one of several Christian pro-lifers who have asked "where have the secular pro-lifers been?" You wonder why you don't hear from us, why we don't participate. I think the reasons you don't hear from us are two-fold: (1) there are very few of us, and it's hard for us to find each other. Many secular pro-lifers think they are the *only* secular person who is pro-life, and they feel alienated by both the secular pro-choice community and the religious pro-life community, so they don't identify themselves, and we can't find them. This means it's hard to get enough of us in one place to even create purely secular pro-life projects. So if we want to do anything helpful for the pro-life movement, we usually need to do it from within the infrastructure of already-built Christian pro-life projects. (2) It's hard to get secularists to do that, because much of the Christian pro-life movement is so ostentatiously Christian that secularists feel they don't belong, or even feel downright unwelcome. In other words, we have no place to gather. We struggle to find each other on our own, outside the mainstream PL movement, and secularists feel unwelcome within the mainstream PL movement. Them: "Why don't we see any secularists helping us? We would love more secular involvement!" Me: "I'm trying to get more to come, but the PL movement right now is incredibly religious, and they feel unwelcome. Think you could help me make it more accessible?" Them: "We shouldn't have to behave differently. If secularists want to be a part of it, why aren't they?" I have a few ideas on how we might improve the situation, but I would like to hear what pro-lifers of faith think could be done to make the overall PL movement more accessible to people of other religious backgrounds. You can see from the comments in this thread it isn't just secularists who feel alienated. We've heard from Mormons and Jews just here now, and in other times we've also heard from liberals and Democrats and homosexuals and all sorts of non-traditional pro-lifers who want to be more involved and also feel alienated. I focus on secularists because I am a secularist, but my goal is to help encourage *the entire country* to be pro-life, not just the conservative Catholics and Protestants, and most of the religious pro-lifers I talk to say they want that too. But if we are really going to make that happen, I think we need to find ways to make the PL movement more accessible to everyone. Religion has been on both sides of every human rights issue I can think of. President Obama told NARAL (I think it was) " God Bless You." Religious leaders have been involved in the effort to deny the unborn rights as well as the effort to establish or restore rights to the unborn. The pro-life movement might encourage more secular involvement by showcasing secular activists more, and complaining more loudly about the double standard involved when those who oppose rights accept support from religious figures and organizations, then claim supporters of rights are forcing religious beliefs on others. So here's the challenge: pro-lifers of faith, how can the PL movement be more accessible to people of other religious backgrounds or of no religious background? Right? Speaking as a Catholic pro-lifer, here's what I see. Lots of religious pro-lifers have NO idea how to approach anything (but especially the PL movement) without bringing God into it. See, we're taught that God has everything to do with everything, so we try to look for God's involvement to show us what to do. So we need secular pro-lifers to show us how else to approach the problem of abortion. Why should women not abort? Why should men care? What needs to be done to help abortion be unnecessary? Basically, what can we say to reach people whose faith (or lack thereof) doesn't tell them that abortion is evil? I do know a little bit about how you feel as a secular pro-lifer, M. I'm a feminist, and there just aren't that many pro-life feminists out there. Many of us found Feminists for Life and practically sobbed with relief, because each of us thought we were the only feminist pro-lifer out there. Well, consider me illuminated! Thanks for the generous explanation--I receive it well. It would be too simplistic to say, "If I were not religious, I would..." but here it goes anyway: If I were not religious and really felt strongly, that is STRONGLY, about the slaughter, then I would commit to working hard with whoever, except satan. I add that there are few secularist pro lifers because, among other factors, there is nothing in secularism except common sense that produces the pro life sentiments and action and only in those who want to think about such things--I am not saying that common sense is the only positive secular quality, and certainly it is common. But secularism, or at least atheism and maybe agnosticism to some degree, pride themselves on the here and now, and that simply hasn´t been, can´t be?, used to justify fighting this ongoing murder rampage of the libs/lefties. I will think about it some more, but can´t immediately think of a way for you to find other generous secularists. You make a good point. I think the secularists who are really committed (like me! :) ) do work with whoever we can. But there are a lot of secularists out there who aren't really pro-life or pro-choice, or maybe they think they're pro-choice by default, because they haven't really engaged in the debate...because they think it's just a religious debate. So I hope the more we can make it accessible, the more they will start thinking about these things. Same goes for any other demographic that isn't traditionally pro-life. You're right. There's a lot of give-and-take that has to happen. I guess we'll have to just keep working at it. Sometimes people invite us to talk to their college pro-life groups about the secular case, which I have always found helpful. I once gave the secular case to an all Catholic pro-life group at an all Catholic university! So those are good steps. I think one good first step is to just increase awareness of how we all come off to each other. Just keeping it in mind can help people be more open, and more generally accepting. Even these conversations with you guys on this blog post feel like little bits of progress to me--little steps toward better understanding each other. I know many, many Christian pro lifers and I have never gotten the impression from any of them that they think they own the pro life movement. Why would they even want to own the pro life movement, even partially? That would imply that no help is needed. No, Christian pro lifers are generally generous people, not perfect, still sinners, but generous. And in this case the generosity implies sharing something that requires work on the part of whoever the work is shared with. If you have seen certain Christian pro lifers react in a less than inviting, less than generous way, if could be more than anything a reaction based on wondering why it took so long for people of other convictions to understand that their help was needed. I'm also a technical writer, though I haven't worked as one for a while. One tenet of technical writing is that one must know one's users or audience. If they're Christian, you can emphasize that you aren't fighting that orientation, just embracing the pro-life part of it. If they're secular, I guess you can pull out your secular stops! I've had people tell me that "obviously I'm a pro-choicer" because I was standing up for the rights of LGBT people. I'm waveringly religious, and the processions with statues of the Virgin Mary overwhelm me at the March. Good post. Just one thing I wanted to comment on. You mentioned the “Such-and-such Parish for Life” banners at the Walk, and of course they're also present in large numbers at the March in DC. I'm pro-life and Hindu, but have some friends at a local Catholic church, and go to the March with them and walk under their parish banner. This group always been welcoming, they organize a bus and there's a pretty large group, so it's harder to get lost when with them. It wouldn't be surprising if many other non-Christians did this as well, although it does make our presence less noticeable.